It still seems to be a controversial topic: can children learn to read and write in more than one language at once? Will they get confused and not do well in either language? Shouldn’t we wait until they can read and write in one language first? There’s no black and white answer to these questions. Like other aspects of parenting, you must do what’s best for your children and what works for your family. ​A great article on this topic is Biliteracy: When should kids start to read and write in their second language? on Bilingual Kidspot. The author differentiates the scenarios of learning to read in similar alphabets versus different ones, as well as different writing systems. Despite initial confusion and transference between languages, there’s no proof that learning to read and write in more than one language simultaneously is harmful. Children all over the world grow up - and thrive - in multilingual contexts. ★ What are your expectations? What level of speaking, reading and writing would you like your children to obtain? ★ What is their motivation? Is there a clear purpose for learning? How do they use the minority language in real life? ★ What are the family’s long-term plans? Are you likely to move countries? Will the children attend school in another language? Where are they likely to go to University? ★ How supportive is your environment? How involved can friends and extended family be in your children’s education? Can you count on their school? Can you find minority language resources? Who can you go to for specific help? ★ Can you teach them yourself? What will you teach them? When? How often? Will you hire a tutor or enroll them in weekend lessons? Another fantastic resource to help you understand multiliteracy and support your children’s development is ‘Learning to Read and Write in the Multilingual Family’, by Xiao-lei Wang. Her book is research and experience based, with lots of practical tips for each age group, planning advice and reflection. No one will ever regret having taught their children their heritage language. The opposite is not always true. Find support in our Facebook community. When you had your first child, how high were your expectations? Did you have a plan for raising him multilingual? Or no clue at all? In this interview, Elena shares how important it was for her to let go of unrealistic expectations and to be kind to herself and her children as they grow up learning her mother tongue, Russian. She gives amazing advice based on what's working for her family (which is what you should do). My name is Elena Mutonono, I am from Ukraine and my husband is from Zimbabwe. Right now we live in New Orleans (USA) and have two children who are 6 and 3 years old. What’s your approach for raising them multilingual? One thing I noticed from reading your blog is that every family decides what works for them. The same is true for us. I speak to my kids in my mother tongue -- Russian -- all the time. We’re also a part of the Russian Community here in New Orleans where my kids get to learn the language, traditions and mingle with other kids and grownups. My husband speaks Shona, but unfortunately he didn’t keep up with it as the kids began speaking English for the most part. They still understand some, but don’t speak it. How do you incorporate the minority languages in your daily lives? Russian is the language I use to communicate with my kids. Now my son can read it, so I let him read something almost every night. As a reward for doing some Russian practice, he gets to watch his favorite Russian movies. In the evening I read for them in Russian and sometimes in English, but if they have questions we discuss them in Russian. I speak Russian at our table as well. You can hear us going back-and-forth in 2 languages, but my husband never feels excluded. In fact, just by being exposed to me talking to kids all the time, he understands 75% of conversational Russian. He sometimes responds in Russian, which always gives kids a chance to laugh. Once a week my older son goes to his Russian lessons and choir practice (it’s done by a Russian-speaking teacher as well). It’s a great opportunity for him to connect with other kids who are also practicing their minority language and developing literacy skills. One of the keys to successfully raise multilingual kids is consistency. How does your family stay motivated and focused? For me staying consistent has been easier than letting go of my high and unrealistic expectations. There’s this notion that was ingrained at some point: as long as you speak and read to your kids, they’re going to be bilingual. I discovered that it takes a lot more work than just speaking and reading. It’s also been humbling to let go of my own expectations and those of my parents’ (who are monolingual and don’t understand why speaking Russian while living in the US can be hard). I’ve learned to be kind to myself and to my kids when they mix languages, adopt foreign word order when they speak, and ask me to repeat or translate what they didn’t understand. I’ve learned that it’s more important for me to share the love of the language and to inspire them to speak even if they make mistakes than terrorize them for their lack of accuracy. How are you introducing Russian literacy to your son? My son didn’t start speaking until he was almost 3, but he began spelling and identifying letters at 2. That was an unusual development, and I wondered how to introduce the Russian alphabet to him (which is Cyrillic, not Latin). So I connected with a group of Russian teachers enthusiasts (www.RussianStepByStep.Com) who were publishing books for Russian immigrants in the US and asked one of the authors to give me some tips. She said that I could either introduce Russian letters at an earlier age or wait until he starts reading in English. It worked. He learned all the 33 letters of the Russian alphabet before he started speaking. Can you tell us about one of your proudest moments? I love it when we’re in the car, his sister says something in English, and he translates it to me into Russian. I love when both kids act out Russian cartoon characters and speak Russian to each other as they play. As a language nerd, I love that my 6-year-old son makes deep linguistic connections between languages. Right now he attends an immersion school where he studies French, and he always connects words and their meanings in Russian, French and English. There are many of such proud moments. The main thing for me is that he stays curious and interested. I want to nurture and celebrate it. I never force him to do any Russian, and don’t overwhelm him, but I like it that language learning is now a part of his being. What has been the biggest challenge so far? How do you try to overcome it? The challenge for me is to keep him interested and motivated. I understand that it might be hard to keep speaking Russian when English is so much easier. I’m proud of him for making an effort every day. I think taking a trip to a Russian-speaking country to visit relatives will help greatly. Another challenge, as I mentioned earlier, is coming to grips with the fact that he’s not as accurate as a six-year-old living in Russia. He speaks like a little immigrant, but I don’t want him to feel deficient about it. I’m concerned that when he goes to Ukraine, he might feel (given the unfortunate cultural nuance of shaming) at fault for not speaking well. I want to be there for him and tell him how well he’s done so far and that making an effort to speak, even as he makes mistakes, is an act of courage. What are your favorite minority language resources at the moment? We’ve been using all the books by Russian Step By Step, and I can also recommend Marianna Avery’s series called “Soroka.” Marianna is my son’s Russian teacher, and she’s passionate about helping Russian-speaking kids learn and develop their literacy skills. What’s your advice for parents considering teaching their kids to read and write at home, especially with different alphabets? Find support. Don’t be afraid to reach out to book authors (especially if these are self-published authors). They are usually approachable and happy to share advice. Make small adjustments and don’t be hard on yourself. I see this happening in expat communities all the time: mothers wish they had started speaking sooner, they feel bad for not having done enough of this and that. Small steps are important. If you haven’t been speaking to your child in a minority language, try to find a group or a couple of friends who do that. If you want to help your child with reading, introduce new letters as you play and spend time reading and looking for these letters as you read books before they go to bed. Learn everywhere and don’t force it when a kid is tired or overwhelmed. If you haven’t done reading today, maybe ask him to “write” something for you (even if it doesn’t make sense). Sing a song, watch a cartoon, ask questions about the characters. Whatever you do, be kind to yourself and to your child. You both are doing an incredible job! Tell us about your work and the Opted Out movement. I started Opted Out at the end of 2015 to connect with my first book readers -- language teachers who wanted to start teaching online. Then it turned into a bigger movement of people who wanted to build small and sustainable businesses online doing what they love best -- teaching languages. As a coach and a language teacher myself, I inspire people to grow as individuals through mindful self-discovery, focused learning and reflection so they build authentic businesses, not cheap copycats. I also believe in making white space in life and business so people can become more creative in their daily lives and channel their creativity to make the world a better place. 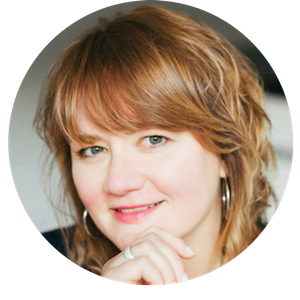 ​Elena Mutonono is a business coach for online language teachers and a writer. She loves books, meaningful conversations, jazzy instrumentals, good food and wine and time with friends. She enjoys spending time with her family, checking out New Orleans eateries (there are many) and taking trips to new places. 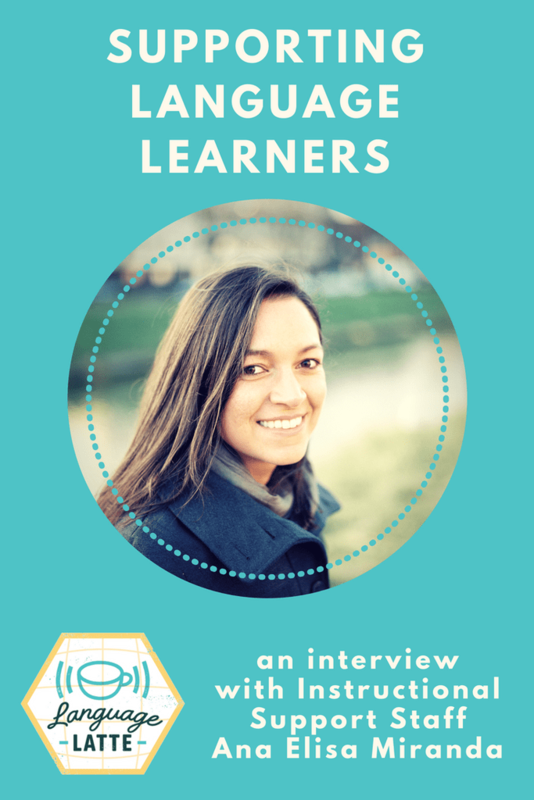 She’s on a mission to help online language teachers discover the freedom and creativity that their job can bring to them, their families and their clients. In this interview you'll get to know a little bit about Hanna's family. She's Hungarian, her Husband is Tunisian and they live in France. They're raising two trilingual sons with lots of play and a laid-back and positive approach where the extended family plays an important role. ​Tell us a little about yourself and your family. ​My Tunisian husband and I met in Nantes, France, during our studies when I left Hungary to spend my Erasmus scholarship there. We fell in love 4 weeks before the end of my stay and we didn’t really believe that this relationship could work out… well, that was 12 years ago :) We moved a lot in France and a little in the UK but we ended up working near Nantes again where our two boys were born. They are 4 and 7 years old now. The goal was clear from the beginning. We wanted them to be able to talk to their relatives in Tunisia and in Hungary in their mother and father tongues. We started with OPOL but then we just realized that they didn’t need the OPOL system to distinguish languages from each other. Both of them understood that we were talking 3 different languages when they were about 2 years old. At this age they stopped mixing them. ​How do you incorporate the minority languages in your daily lives? ​I started by reading Barbara Adelilah-Bauer’s books even before they were born. This helped a lot and we understood that the secret is exposure, exposure and exposure. It was a lot easier in the beginning when we had only one child. We had more time and no one was talking to him in French at home. We were playing and reading in Hungarian and Arabic all the time. ​Since his brother was born the situation changed a lot. They love playing together but they use only French - the majority language. We are both working parents, so they spend their days in French environment (nursery before, now school) and they just don’t switch. But we keep following the plan. > to help them grow up as open minded, respectful and tolerant human beings. > Keeping this learning process fun and non-obligatory. We highlight success and never point out errors. We never oblige them to speak any language. > By showing them how these languages are useful in everyday life with books, games, videos, magazines. > By creating situations where they are in full immersion: playdates with other bilingual children in France, and holidays in Tunisia and Hungary. The grandmothers help us a lot too. We “import” one of them for every short school holiday. Instead of sending them to an activity center we try to create full immersion at home. How are you introducing minority language literacy? Arabic and Hungarian are two languages that are easy to read once you learned the alphabet because you pronounce all the letters but reading French is quite complicated with its phonemes and silent letters. This is why we decided to wait until they read and write French before introducing minority language literacy. The surprise came when at age 7 our older son came back from 3 weeks in Hungary and spontaneously started reading Hungarian. He said grandmother had showed him the letters to pronounce in a different way. And he auto-corrects his mistakes when he hears them. Now we can concentrate on learning the Arabic alphabet. When I was pregnant with the boys I realized that most of the Arabic educational games were not as high quality as the resources we can find in other languages. The products I was looking for just didn’t exist. This is why I decided to create a new collection of educational games in collaboration with Arabic teachers and linguists. Daradam was born in 2016. My third “baby” is this publishing house dedicated to create love for the language(s) and the cultural heritage of the Arab region. Our games can be used at home just like in school, and they are great for native Arabic speaking children and also for those learning Arabic as a second language. ​Can you tell us about one of your proudest moments? Ali (4yo): I want to go back to France. Ali: Everyone is talking to me in Hungarian here and I don't understand everything. Me: So why don't you tell them when you don't understand something? Me: You know this is very normal. But don't worry, because you have a "super hero" brain with great capacities and you just need to be patient for 2-3 days so your brain can get used to Hungarian. Aunt: This is Tonton Jean. He doesn't speak Hungarian. Ali: It's ok. He only needs 3 days. Ali: I speak so much in Hungarian I started to forget French. We are still struggling with Arabic. > with a low budget. Flight tickets are just so expensive compared to flights inside Europe. > with a 99% French speaking Tunisian family. > in a small French city where we don’t have a lot of choices when it comes to Arabic language classes. I believe we will find solutions in 2019 when the kids will be able to travel a little more. Obviously our favorite resources are the Daradam games because we created them just like we wanted them to be: fun, responsible, cultural and educational with an elegant and modern design. Daradam is a family project, inspired by lots of love. Thank you, Ana for letting me talk about it. Every share, every like, every post is a great help for a small business. We highly appreciate them because it’s the Daradam community that helps us grow. And growing means publishing new fun resources in Arabic. Photo permissions and credits: Hanna Lenda. Hanna and her Tunisian husband have two trilingual sons. She has a Master degree in Product Design. She has lived in Hungary, the UK and France. She has worked on numerous interior design projects in the MENA region before launching Daradam, a new brand of educational games highlighting the language and the cultural heritage of the Arab region. 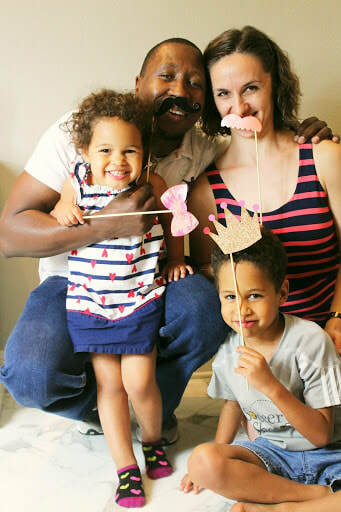 Today we are getting to know Ute, multilingual mom of 3 teens, now living in The Netherlands. She grew up multilingual herself, has lived in several countries and has studied and taught languages and literature. Her children are growing up in a country that is neither hers or her husband's, and their community is very international. She tells us the challenges they faced and how they needed to adjust course on their multilingual family approach. Ute is a language consultant for multilingual families and has a lot to share from her own life and professional experience. I have lived in Italy, Switzerland, France and the Netherlands and have managed to thrive in all the places I've lived so far. My German parents had lived in Belgium, Italy and France for over 30 years before repatriating in the late eighties. I grew up in Italy as a simultaneous bilingual Italian/German and acquired Swiss German thanks to a television channel that was available in our area in Northern Italy for a short time when I was 4-5 years old. I started learning French when I was 6, English when I was 11, Spanish in my twenties and Dutch in my late thirties – I'm fascinated by languages and studied Romance Languages and Literature, more specifically Italian and French literature and linguistics. I also studied Latin, Old French and Old Provençal: all languages that are not spoken anymore. I did my masters and PhD in French medieval literature/linguistics (i.e. philology), taught Italian historical linguistics, and French medieval literature at the Department of Romance Languages and Literature at the University in Zurich, where I worked as an Assistant, Lecturer and Researcher, specialized in Dialectology, Bi-/Multilingualism, Communication Theory, Psycho- and Sociolinguistics. I obtained a PostDoc grant for my research on a Florentine poet from the 14th Century and spent 3,5 years in Florence, studying medieval manuscripts. My son was born in Florence in 2003. My husband was stay-at-home-father whilst I was the sole bread winner for the next 2,5 years. After my PostDoc grant, my husband and I looked for jobs all over Europe and when he got a great offer in The Hague we moved to the Netherlands. Unfortunately I wasn't as successful with my job hunting: my historical approach in linguistics and my knowledge of philology didn't seem to be required here. When a year after our arrival to the Netherlands our twin-daughters were born, I decided to take time off and concentrate on my three children. I learned Dutch alongside my son and polished up my English: the community in The Hague is very international. I had the opportunity to collaborate at a research project at the Huygens Instituut in The Hague, but quickly found out that I wanted to be more in touch with the international community. I started volunteering at my children's school. I organized up to 14 talks and welcomed on average 400 new families per year. This was when I noticed that many internationals would benefit from more support and guidance when arriving to a new place and I started my own company, Ute's International Lounge, designed a welcome program for newly arrived families (ENJOY your Life in The Hague) and started holding workshops and talks about international childhood, resilience, how to settle in easier in the Netherlands and, of course, raising children with multiple languages. 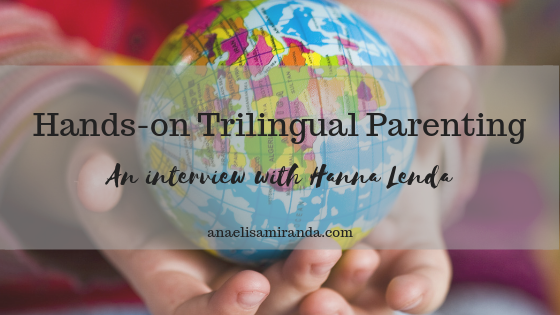 I observed that many families who live abroad and raise their children with multiple languages struggle with finding the right balance regarding the languages they want and can support, and those they need to learn or acquire. Especially when leading a very mobile life, this turns out to be a major issue for multilingual families: their children are often schooled in their 3rd, 4th or 5th language. 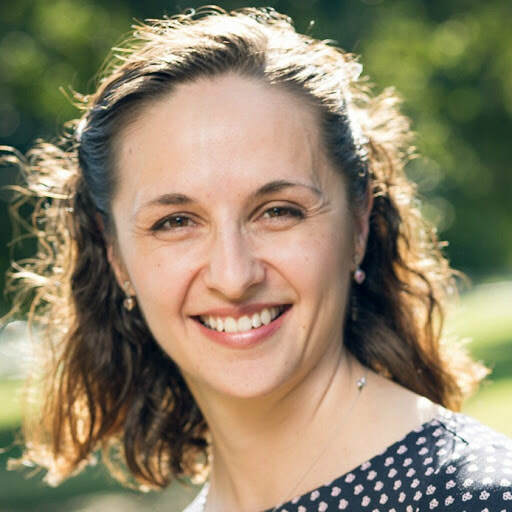 As a Language Consultant for multilingual families and educators, I help families and educators support those children's multilingualism, maintain their home language and culture, whilst fostering the school and local languages and cultures. As an Intercultural Communication Trainer I help internationals become "internationally fluent", i.e. to understand the other culture and language and avoid misunderstandings in order to communicate effectively. My son is now almost 16 and my twin-daughters 12,5 years old. They all grow up with multiple languages and in a very international community which I am very happy about because they are all very open minded, and very flexible. What was your approach for raising your children multilingual? I knew that I had to make some kind of plan when my son was born, as we were most probably going to move from Italy. I'm bilingual myself so I chose to talk the language that was most natural for me: Italian. My husband spoke Swiss German to our son, and my husband and I talked German to each other. Therefore my son was exposed to three languages since day one. When we moved to the Netherlands, Dutch and English were added naturally. My son went to a Dutch daycare. Although he started to respond in Dutch or Swiss German to me a few weeks after we arrived, I kept on talking Italian to him. We maintained Italian and Swiss German also with our twin-daughters. When my daughters were 1,5 years old, they developed a secret language. I was prepared that this could happen and knew that they would stop eventually. For our son, not understanding his sisters was very stressful, so after 3 months we decided to change our narrow down our family languages to German only. It was an experiment that we discussed also with our son who, as I said before, was anyways talking Dutch, Swiss German and English (he started attending school in English when he was 4 years old). A few weeks later, our daughters stopped speaking that secret language. It seemed like all three children were more relaxed and happy with the language situation in our family, so we kept this strategy of mL@H – minority language at home – while keeping listening to Italian and Swiss German stories and songs. Since our children were very young, we made sure to talk a lot with them – not only "to" them! – i.e. involving them in discussions, asking them open questions in order to make sure they are actively using the languages. As they needed Dutch at daycare and in the community, and English at school, I made sure they had smooth transitions between all of them by providing multilingual moments at home too. For example, when they came back from daycare or school, I let them talk about their day in the language they prefer. After an hour or two, once they are "fully arrived home", I model the home language which helps them make the switch and speak German only by dinner time. I needed this transition time when I was a child too. It helps to process what they've learned and experienced in the specific language, and later we can pick up some of it in our home language too, which allows to foster their home language vocabulary. What does multilingualism look like in your home today? Like I said before, we talk all the languages we like. There is no strict rule usually. We try to focus on our home language at breakfast and dinner, or when we play cards or board games together – which we still do regularly! – but for the rest, I consider it more important to keep the communication flowing and it can be in any of the languages my children speak. This is the advantage of sharing all the languages with my children. My husband, who doesn't understand or speak Spanish, can't participate in discussions in Spanish, so we switch to another language when he is there. Much has happened since the switch from Italian, Swiss German and German to German only as home language when our children were younger. All our children are schooled in English now and Spanish and French are added to the list, and my son is learning Chinese at the moment. All my children speak Dutch fluently, and read and write it pretty well. My son is pluriliterate in English, German, Dutch, Spanish. He also speaks Italian and reads it, although it requires more effort. At home we speak a mix of all our languages, depending on our mood, the topic and the social context. If someone quotes an article or shares an experience, he or she can do it in the language it is written or it was experienced. I always try to keep up with German at home, and Italian and Swiss German during holidays. There are always one or two languages that are more dominant and for our children the most dominant languages are English, German and Dutch. What benefits does knowing different cultures and languages bring to your children? Knowing different cultures and languages broadens our horizon and makes us all less judgmental. We also tend to play with languages, put German endings to English words or vice versa, play with multiple accents. We don't have boundaries when it comes to languages and we don't judge accents: we understand people with very diverse accents and I think we look beyond them. What really matters is to understand the meaning of what one says. Our children are very good at spotting differences in intonation and pace in different languages and can distinguish subtle discrepancies. We never focus on nationality, race or religion. I notice this difference when we visit friends who have other approaches to languages and cultures. In our family we concentrate on the character of the person, her or his interests and preferences. I like the curiosity and flexibility my children have to switch not only from one language to the other in no time – which is how I grew up too – but also from one culture to the other. They sing songs in languages they don't understand, try food from many different cultures and are curious to know about other traditions, values and beliefs. Children who grow up in multiple cultures constantly move from one "world" to the other, which is not easy, but they do it naturally, and in the same way they move between one language and the other. Now that they are teenagers (and tweens), they try to define their identity which is not always easy. For some aspects they would rather be Swiss, for others German, Dutch, Italian or English. I know what it feels like to be "neither X nor Y", but I keep on telling them that whenever they feel like not belonging to one group, to always remember that they are "not only... but also..." – it is a process of self-discovery and self-definition which takes a while. I remember this from when I was their age. My children grow up in a country that is neither the one my husband nor I grew up in. I would have loved my children to grow up in Italy, in order to have this in common with them and my husband would have liked them to have some experience living in Switzerland. We know that our children will always grow up differently than we, their parents: they are another generation, grow up in other circumstances and with other preferences. I am very much aware of the downsides of growing up this way and I try to help my children the best I can. I can't teach them how to feel, I can only help them find ways to cope with this in a healthy way. We all had moments of profound sadness and anxiety, and I know that my children had to learn how to grieve very early... It is heartbreaking to see them suffer, but I am very proud to see that they are finding their very personal way to deal with it and that they all have long lasting friendships. Can you tell us about some of your proudest moments? There are so many! With regards of my children's multilingualism, it's maybe when my son used Italian and Swiss German for the first time in a sentence because he was speaking to me and my husband, while looking at both of us; he was only 1,4 years old. – I'm very proud of my children taking all their steps, no matter how small. They are amazing and such a pleasure to observe and nurture! Concerning my children being multicultural and their open-mindedness, I notice that whenever someone makes comments about someone's provenience, they try to mediate and avoid judgments. They also defend the Dutch, Swiss, British, Italians etc, whenever someone makes negative comments about the culture! I feel the same way. When a culture or society is criticized in the media or literature, my first reaction is always to defend and mediate...I guess it's déformation professionnelle. And what were your biggest challenges? How did you deal with them? I think we all learn to deal with many challenges. Most of them seem big when we're not prepared, but if they reoccur, they become less challenging. 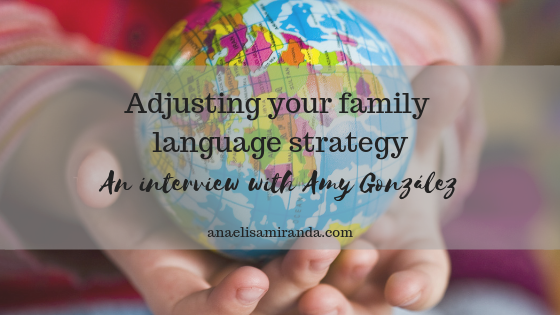 Concerning my children's languages, the first big challenge was when my daughters spoke a secret language and we had to change our language strategy. Also, when one of my daughters had issues with her speech and helping her required a lot of patience from us all. But these challenges were also important learning opportunities for us all. As a linguist I know the theory, the best practices, but I experienced first hand how hard reality can be. When all you would advise doesn't work in your own family you reconsider everything you've learned and researched and try to find alternative solutions. I am much more cautious on giving advice now than before having children because there is never one solution that fits all! Every child and every family is different and deserves a very personalized solution that is supportive but also flexible enough to adapt to the constantly changing needs. Today I know that it is for a great part thanks to these issues that we experienced in our family that I am the Language Consultant I am today. How was your experience in supporting your children’s minority literacy? My son attended an Italian daycare before we moved to the Netherlands. All three children attended a Dutch daycare and are now schooled in English. English and Dutch are the languages they prefer speaking, reading and writing, and are their most dominant languages. Although German is our home language, it is the minority language in the community my children grow up in. Only few of our friends speak it, and when we meet, our children tend to either talk in English or Dutch together. I try to nurture it as much as I can at home, but my children's German literacy skills are not at the same level as English and will probably never be – unless they move to a German speaking country, and study or work there. My three children are all very different when it comes to reading, writing and speaking German (and the other languages they're learning: Spanish and French at school; and my son is learning Chinese). Not all of them are avid readers. Reading surely contributes to improve the vocabulary, but speaking, using the new words on a regular basis and in diverse contexts is what helps them consolidate their vocabulary in a more sustainable way. Compared to many other parents, I am quite laid-back because I know that we can't force our children to acquire or learn a language. The older our children become, the more school, community and peers are more important: it was so for me growing up in Italy, then living in Switzerland and working in a mainly French and Italian environment, and it is the same for my children here in the Netherlands. Each child has his or her own language preferences and all I can do as a parent is to provide resources, input and opportunities for German (and the other minoritized languages), but ultimately, they have to decide themselves how much they want to learn and how. My children are very self-disciplined and I observe that their language proficiency is improving. If this wouldn't be the case, I would find ways to help them improve their language skills. Furthermore, my children know what my expectations are: they should be able to have a conversation with native speakers (i.e. they can understand and make themselves understood), to read age appropriate texts and write with not too many spelling mistakes. I know that many parents struggle when they realize that their children are better in the school language (or local language) and prefer it to the home languages, but this is a side effect of our children growing up in another country and are schooled in another language. Supporting our children's multilingualism is a long-term commitment and doesn't stop when they start reading. For me, literacy is not only the ability to read and write, it is also the ability to understand different registers, to understand non-verbal clues, being able to understand jokes and sayings, metaphors in the other language and more. It is not only about language, it is also about the culture. My children watch German and Dutch news on a regular basis, watch movies in the other languages and listen to debates and we discuss about very diverse topics. We discuss about Geography, History, Chemistry, Physics, Maths in German. I do this intentionally in order to help them to become fluent in all domains of life in their other languages. As my children have very different taste in books, I let them choose. Everything is fine, from novel to comics, to cook books. What would you tell parents who hesitate about teaching their kids to read in multiple languages? I would tell them to start with small steps and to lead by example. Some children can be intimidated by multilingual parents and settings, and think that they are not "good enough". Therefore I always recommend to give children the opportunity to acquire or learn the languages at their very own pace. Let your child lead you when it comes to reading. Some children want to read in all their languages simultaneously, others prefer concentrating on one language only and start asking about how to read a text in the other language later. Choose topics your child is interested in and ask open questions about what you're reading. This way you can find out what your child needs help with. Maybe they understand the overall meaning of a story but need some explanation about single words. This doesn't only apply to young children. Teenagers might need some help too. Like for us adults: when we read a text about at topic we're not that familiar with, we have to look up words and learn how to use them in other contexts. Reading is not only being able to read fluently, it's about understanding what you read, understanding the structure and the multiple layers of the language. Another advice is to not push your children, and don't compare them to peers! It can be frustrating to see that our child takes ages to read a text that peers (or siblings) could reed in no time. Our children have their very own pace and way of acquiring and learning languages and with consistency and patience we obtain better results that last longer than with constrictions and obligations. We all learn better when we enjoy what we're doing. It's the same for adults and children. What are your favorite resources on multilingualism at the moment? There are so many of sites and social media groups where parents can find answers and support! I always advise to make sure to get professional advice… There are so many who just share their own experience and give advice based on their own experience only. But every case is different and deserves tailored advice and support. I can recommend the following books – but there are so many more! ★ Colin Baker, Foundations of bilingual education and bilingualism. ★ Adam Beck, Maximise your child’s bilingual ability. ★ Ellen Bialystok, Bilingualism in development. Language, Literacy & Cognition. ★ Andreas Braun and Tony Cline, Language Strategies for Trilingual Families. ★ Annick de Houwer, An Introduction to Bilingual Development. ★ Julia Festman et alii, Raising multilingual children. Parents’ and teachers’ guides. ★ Ofelia Garcia, Bilingual Education in the 21st Century. ★ François Grosjean, Bilingual Life and Reality. ★Kenneth Hyltenstamm (ed), Bilingualism across the lifespan, Aspects of acquisition, maturity and loss. ★ Ajit K. Mohanty, The Multilingual Reality. Living with Languages, Multilingual Matters. ★Johanne Paradis et alii, Dual language development and disorders. A handbook on bilingualism and second language learning. ★Tracey Tokuhama-Espinosa, Raising multilingual children. ★Xiao-lei Wang, Growing up with three languages. ★Barbara, Zurer Pearson, Raising a bilingual child. Tell us more about Ute’s International Lounge. I started Ute's International Lounge in 2014 to help internationals, mainly multilingual families, get informed about what an international life entails with regards to cultures and languages. I offer them support with all their languages and cultures. 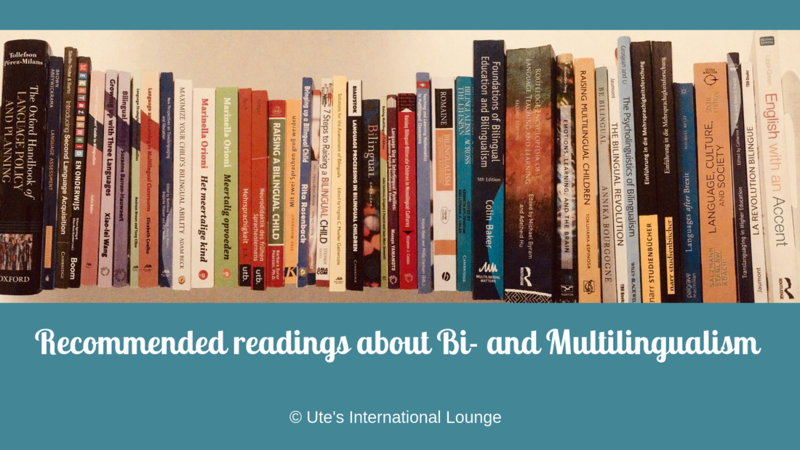 Children don't become bi- or multilingual or multicultural by magic, and raising a multilingual and multicultural child requires a lot of work, patience, and in my experience a plan. We might be ready and excited for this journey, but this doesn't mean that we are prepared. I help multilingual families to be prepared, informed about the best practices and strategies and to have plan B and C at hand, should plan A not work as expected. 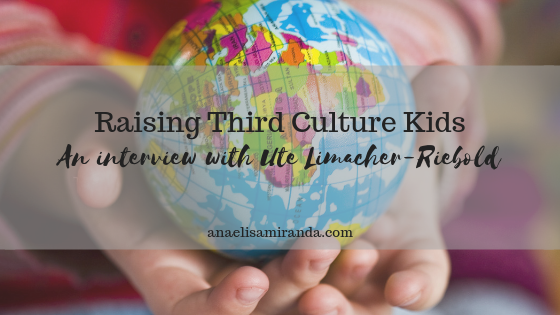 Dr. Ute Limacher-Riebold​ has lived in several European countries. She holds a PhD in Philology and is a professional Language Consultant and Intercultural Communication Trainer. She is a linguist and multilingual herself, and raises her three children with multiple languages. Her expertise lies in linguistics and intercultural communication. 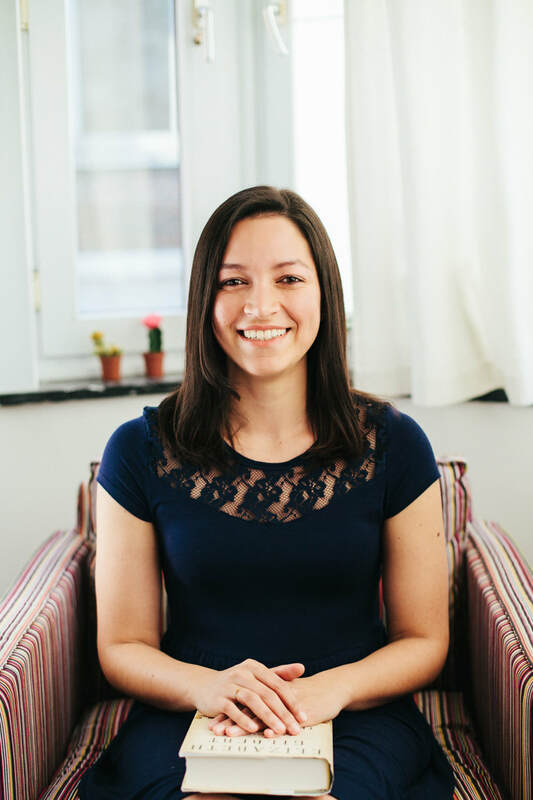 In her consultations and person-tailored training, she helps and empowers her clients to embrace all their languages and cultures. She offers all her services online and offline in English, Dutch, French, German and Italian. When your first child is born and you decide on a bi/multilingual approach to raising them, you probably don't think of what could go wrong. You don't have a Plan B. But the best of strategies and the most motivated of families might also fail to achieve their goals. As you'll learn from Amy's story, you do need a Plan B and you can't hesitate in trying something new until you find what works for your family. I'm so glad to share this encouraging story, filled with great advice and ideas. I was born in France to French parents; when I was 10 my family moved to Spain, where I studied in an international British school. When time came to pursue my higher education, I chose to move to the U.K, where I spent 6 years before moving back to France. It is in Paris -where we live today- that I met my husband, born and bred in Spain, who had moved here for work. We are now the proud parents of 2 little girls aged 6 and 2, whom we decided to rear trilingual from their birth. Full minority language immersion; though this has not always been the case. Our approach has evolved to full immersion to adapt to our circumstances. Originally, having not read up on bilingual education, we went for the commonly-known strategy of One Person One Language (OPOL): Daddy speaking Spanish, me English, and using French as the family communication language. However, by the time she was 4, my eldest was a passive trilingual (she understood the minority languages but did not speak them). That was not our aim since we want our children to be fully trilingual and triliterate. After reading up on bilingual education, I realised using the Majority Language as family communication language had been a big mistake. I carried out a test: I spent a whole day speaking English exclusively (which my husband speaks) to the whole family. My eldest picked up on it and straight away made attempts at using English! As a result, we changed approach overnight, banning the use of the Majority Language from our home. We even went further, kicking the Majority Language out from our home, replacing anything French by English or Spanish. We try to make our home a minority language haven to immerse our daughters in our respective languages. Another big lesson learnt from this experience, is that a language strategy is not something set in stone. There is no one-size-fits-all approach. I have met a trilingual family with the same OPOL strategy we initially had, for whom it worked very well, and yet it did not for us. If your approach does not work, don’t be scared to test another one. In fact, we do not “incorporate” the minority languages as such; we “live” them. They have become our way of life. From the moment we walk through our main door, the use of French is banned, and 2 little Spanish and British flags stuck on the entrance door are there to remind everybody of it, should need be. On week-days, my daughters breakfast to the sound of an online British radio, and to cartoons in English or Spanish on Netflix at the weekend. When we walk out of our home, we still use the minority language between us but obviously we are back into the Majority Language community, so we use French with the people we interact with. When we return home at the end of the day, we turn on the British radio; and when dad hits home we put the Spanish telly on. The only French tolerated is for my eldest daughter’s homework, though we try to always stick to English or Spanish to explain them. After French homework, we loop with homemade English homework: a few pages of reading and writing a sentence of her choice. Amy and her daughters playing 'Pass the Word'. We were so close to failure that this works as an endless motivation for us. We finally understood what it takes and will not let go. Of course, there can be times when I feel low and frustrated, but my husband’s discrete but strong determination is my rock. 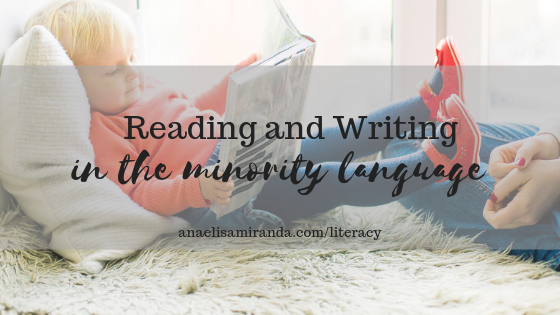 How are you introducing minority language literacy to your oldest daughter? Literacy came to us a bit by accident. We had planned to let school teach our eldest daughter and build onto it. So when she learned the French ABC, we did the same in English and Spanish. But then, we applied for a Wednesday English school programme that sets entry tests to applicants. As part of the test, my daughter had to know phonics. Hence, I started teaching her phonics, and when she did not get a spot on that programme, I left the phonics at that. However, when French school introduced her to blending last year, my daughter used this and her knowledge of English phonics to start reading on her own in English and Spanish! In France, formal teaching of reading only starts when children are aged 6, but I could not see her waiting 9 months to satisfy her thirst for reading. For that reason, I took it on me to initiate her to reading in English. This year, she has a handful of bilingual classmates that belong to the international division of her school, where they have 6 hours of teaching in English. My daughter has expressed the wish to join the division, that entails sitting an entry test on reading and writing. Hence, I have recently started teaching her to write. This is why I have introduced the “English” homework mentioned above. My proudest moment was when one day, a friend who is a bilingual education skeptic, literally had his jaw drop in utter disbelief when he heard my eldest addressing me in English. It seemed like a scene straight out of a cartoon! Nothing was said, but the jaw dropping and gobsmacked look said it all. That was my proud moment: proud of my daughter, proud not to have given up, proud that my daughter demonstrated that bilingual education works. My eldest daughter’s resistance to the minority languages! French is always on a pedestal and she never misses an opportunity to say she prefers French or slip a French word if she can help it. 3 tiny flags for each one of our languages. We asked her to stick the two minority language flags on the outside of our front door, to remind her which languages she should use when she walks into the house. On the inside of the front door, we had her post the French flag to remind her that, on the way out, she could now switch to using the Majority Language. This very visual concept really helped her to understand the change occurring in our home, and acted as a reminder whenever she deliberately slipped up and we sent her to look them up. We regularly remind her of why we insist so much on languages, and particularly English as she does not understand why her French mother insists on speaking English. We explain to her the importance of the English language in society, how it will help her later on at school and in life. We never miss an opportunity to point at minority language speakers, especially children like her. It seems like it is slowly sinking in. Having a handful bilingual classmates in her year has also greatly helped. What are your favourite minority language resources at the moment? My daughters’ music player and Julia Donaldson audiobooks. My little one has just discovered how enjoyable they are and regularly asks her sister or me to play “What the ladybird heard and other stories” on their player. This kind of resources are great because it develops the child’s taste for books, independent reading and it creates minority language exposure in their own room at their demand. What’s your advice for parents considering teaching their kids to read and write at home? Set up a routine! I am convinced that what has really helped my eldest daughter in developing her reading skills is having her reading every single day. It does not have to be a whole set of phonics flashcards or book, but a few cards or pages every day. For reading, make it enjoyable, snuggle together on the sofa with a nice warm blanket, turn all the media off, ask your spouse to entertain the other siblings. Make it a nice one-on-one time. Tell us about your blog, Our ml home. When I was at my lowest in the trilingual education adventure, I came across an amazing community at the Bilingual Zoo. They have supported me and inspired me. The book written by the forum’s administrator, Adam Beck, “Maximize Your Child’s Bilingual Ability” has changed my vision of how to go about trilingual education and taught me to think out of the box. Over time, I myself started helping other members suggesting ideas, giving tips. A fellow bilingual mum suggested I should write about my experience, which made me realise that through a blog, I might be able to help other struggling bilingual parents. What bilingual parents seemed to appreciate about my posts at the Bilingual Zoo were my tips and ideas, so I decided to design my blog as a little “toolbox” of practical tips and ideas. At the end of my posts, readers are invited to share their own tips and ideas on the topic. Each child being different, some ideas might work whilst others won’t. This is why I would love the blog to act as a bank of ideas bilingual parents could pick and choose from according to their personal circumstances and child’s personality. Photo credits and permission: Amy Gonzáles, Our ml home. ​Amy is a French mum of two living in Paris. She works in insurance broking and has a blog about raising trilingual children - Our ml home. You can also find Our ml home on Facebook and Twitter. Make sure you visit Our ml home - explore all her practical tips, share your experience, ask questions or just say hello! ​Hey! I'm Ana - a teacher who loves reading, writing, traveling and nature.